This posting shows the many dangers public sector unions pose to our economy that could have a militant ending as described below. It also presents a current on-going example of an electricians' union maneuvering itself to represent law professionals who work for the state of NJ. As recently as the 1950s there were no unions for government workers. Public sector employees were expected to earn a bit less than their private-sector equivalents. The reasons they did so included an interest in public service, job security, & reasonable benefits. But that changed in the late fifties with New York City Mayor Robert Wagner's cynical appeal to the votes of city workers (a form of Death Of Democracy). Wagner signed an executive order authorizing city workers to unionize, & soon other city & state Democrat legislators around the country followed his lead. In 1962 JFK signed executive order 10988 which allowed unionization of the federal workforce - this also was the genesis of the unionized public work force in many states & cities. This led to the large membership growth of public employees unions such as The American Federation of State, County, & Municipal Employees (AFSCME), the Service Employees International Union (SEIU), & the National Education Association (NEA). Since January 2008 the private sector has lost 8 million jobs while governments @ all level have added 600,000. Federal employees total average compensation is twice that of pay & benefits of the average in the private sector - see first graph above. Average total compensation per hour worked for state & city workers is $39.66 compared to $27.42 in the private sector according to the BOL & the Cato Institute. Other than a 34% differential in wages & salaries the biggest disparities are that state & city public sector defined benefit pensions are 7 times as large as those in the private sector & public sector healthcare insurance is over twice as costly. 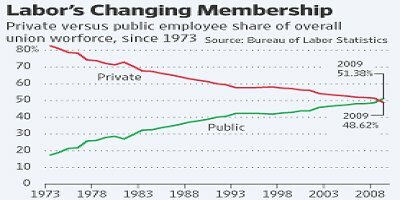 In 1973 there were four times as many private sector union employees as public sector union employees - Last year, for the first time in our history, a majority of union members worked for the government - see second graph above. Amity Shlaes writes "if we did not have so many government employees today, the cost of sustaining them would not be so high." Many states are just simply out of money teetering on bankruptcy. NY's Governor-elect Andrew Cuomo & even CA's Governor-elect Jerry Brown who introduced public sector collective bargaining in CA in 1978 has told the teachers' unions they are going to have to tighten their belts. FDR was against public employee unions because he knew it pitted various groups of people against all taxpayers - public sector employees are paid with taxpayer dollars & allowing taxpayer dollars to be given as dues to a union who then provides political contributions to elected officials who will agree to give them even more taxpayer dollars was even too much of a conflict of interest for FDR to stand. MN Governor Tim Pawlenty recently wrote "The moral case for unions - protecting working families from exploitation - does not apply to public employment. 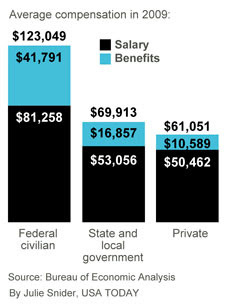 Government employees today are among the most protected, well paid employees in the country. Ironically, public sector unions have become the exploiters, & working families once again need someone to stand up for them." Just ask yourself what type of OSHA-violating work conditions government workers could possibly face that would warrant forming a union? With the above as background please consider the current ongoing seemingly far fetched but true case of law professionals employed by the state of NJ becoming unionized represented by the International Brotherhood of Electrical Workers (IBEW). Below are two letters written by a subscriber to ReturnToExcellence.net who works for the state in the Department of Law & Public Safety - the person has a law degree & is awaiting details of the electricians' union representation & forced deductions from their pay whether they join the union or not. The letters appeal to the appropriate elected state representatives for relief of this condition. Many who have been in the public sector unions for decades can find themselves retiring in their early fifties with an inflation adjusted pension near their full final salary plus lifetime free health care while their private sector employee counterparts continue to work well into their sixties or seventies with their taxes going to support the pension & healthcare benefits of their public sector unionized neighbors. Carol believes this is the basis of a militant relationship of neighbor against neighbor. J.L. Gabbert describes this danger when he writes "Imagine the irony (little imagination required) when a 60-something worker in the private sector, who is still working @ half his former salary because all he has is a rolled over 401(k) from a chapter 11 bankrupt former employer, is faced with a tax increase to continue funding the six-digit public pension of a state or city worker who retired 30 years ago @ age 50." Steve Walde echoes Gabbert's thoughts when he writes "as the baby boomers begin to retire it will become obvious that there are two Americas. The first consists of those with pensions, mostly government workers, & the second, the rest of us. These government retirees, many of them a decade or more short of age 65, will be seen @ the local golf courses & shopping malls, while the others will be toiling away @ some form of job well into the 60s & beyond." The above real life examples could very probably not end well as resentment is built up from one neighbor to another as more & more of this comes out. The above mentioned attorney who is near retirement @ the end of a long non-union working career in state employment & is just now in the process of becoming represented by an electricians' union will not be around to collect all of the promised magnificent union benefits decades from now. Unfortunately, in the economic real world neither will anyone else. As you know, I am employed by the State of New Jersey, and I would like to call your attention to the issue of forced unionization - and to ask you to consider "Right-To-Work" legislation. To be clear, I am not writing you as a state employee but as a constituent to my state legislators. Recently a majority of my colleagues voted to certify the International Brotherhood of Electrical Workers ("IBEW") as the collective bargaining unit for my unit of state employment. Previously, my unit was not represented by a labor union. I did not participate in that vote because of my political and ideological beliefs. As you probably know among other reasons, I am active in a non-partisan and single-issue group called Americans for Fair Taxation. 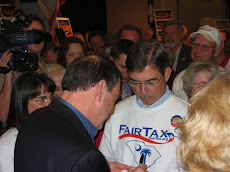 This group educates the public about a federal tax reform proposal you know as the FairTax. As an illustration of my dissatisfaction, the IBEW last year contributed $10,000 to the campaign of Congressman Frank Pallone, NJ-06. 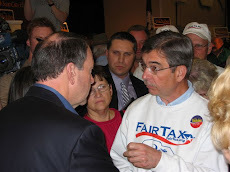 In this last election, Pallone ran a series of false and misleading ads about the FairTax in an attempt to discredit his opponent. I find the thought repugnant that a single penny of my forced dues should benefit candidates such as Frank Pallone and his ilk. I am aware of my option to become a non-member and pay less so as to theoretically not support the political agenda of the IBEW. See Chicago Teachers Union v. Hudson, 475 U.S. 292, 106 S.Ct. 1066, 89 L.Ed.2d 232, 1986 LEXIS 27. But that option does not satisfy me. Money is fungible. I also am not sanguine about receiving benefits that I otherwise would be compelled to pay for, if I do not theoretically support the political goals of the IBEW. I submit for your consideration the following link containing right-to-work laws in other states: http://www.nrtw.org/rtws.htm. The Virginia and Iowa statutes deserve highlighting because of their sanctions for violations. Please review this request and advise me of you position. Thank you. As a follow-up to my earlier e-mail and my telephone conversation with Ben, I would like to propose that you introduce a Right-To-Work law as your opening gambit. Your fall-back should be as follows: Members of a collective bargaining unit should have full rights of union membership by paying the equivalent of an "agency fee." No part of these dues should be used for any purpose other than collective bargaining, contract administration and grievance mediation. If a union, at any level of its organization, is to support political activity, that activity is to be funded entirely from voluntary contributions of its members. As a corollary, no part of the "agency fee" is to support upper hierarchies of the union organization if any level of those hierarchies supports political activity. All political activity must be separately administered and fully accounted for. The management concept is to turn this issue on its head. Under existing law, employees support union political activity unless they affirmatively opt out. Under this proposal, employees will support union political activity only if they affirmatively opt in. The proposed arrangement is far more equitable. I am the attorney who wrote the two letters queoted in this posting. As a 62-year-old New Jersey State employee who will be lucky if he can retire in ten years, I was struck by the comment about the state or city worker who retired 30 years ago at age 50. The comment takes me back to a PG-13-rated scene from the movie "When Harry met Sally." There Meg Ryan sits with Billy Crystal in a restaurant. Those of you who saw the movie recall what Meg Ryan does next. The character with whom I identify is the older woman two tables away who calls the waiter over and says, "I'll have what she's having!" The case settled quickly for a refund of all representations fees collected without proper notice under Hudson plus counsel fees for the National Right to Work Attorney, local counsel and costs.